Please join the S3D Centre at Emily Carr and VanVR Meetup group on Monday February 23rd at the MOCAP studio inside Intersections Digital Studios @ Emily Carr! 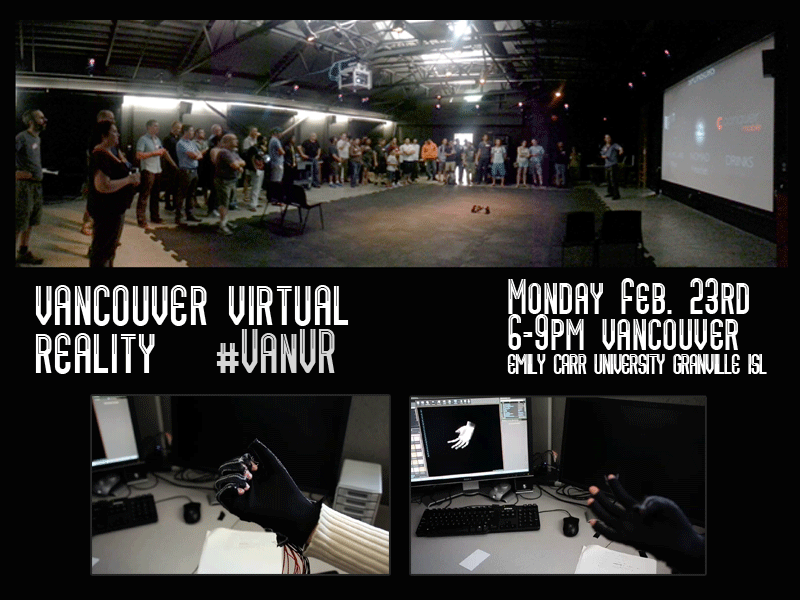 In our fourth partnered event with VanVR, we showcase for a very first public look the work of our team at Emily Carr for a wearable VR glove. As always, attendees will be encouraged to experience all the demos with wireless VR headsets and other tools provided by the evening’s special guests! Lamper VR - How far can you fly as a small bug in a HUGE world? Please navigate to the VanVR meetup page to RSVP your attendance. The guest list will be tightly controlled on the evening of the event to avoid excessive wait times for the demos and overcrowding. Thank you for understanding! Follow the signs for “MOCOP Studio, Intersections Digital Studios” once inside Emily Carr.